Large railroad whose main lines went from Chicago to California. 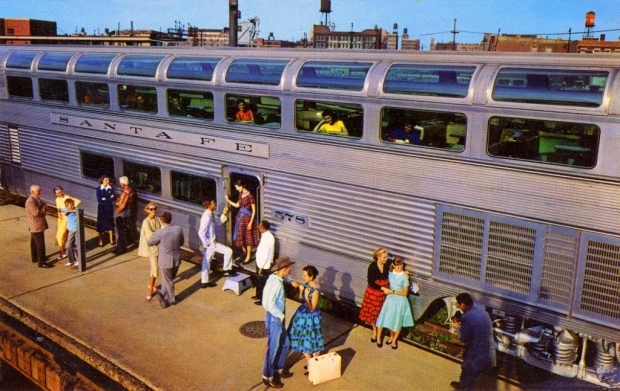 It almost didn't join Amtrak in 1971 as its passenger services were of the few that were turning a profit. In its last two decades of existence there were pending mergers with other railroads which never took place, most notably with Southern Pacific in the 1980s, as some locomotives from both companies were painted in a similar motif. But there was a merger with Burlington Northern, itself a merger combining the Burlington, Great Northern, and Northern Pacific lines. Originally known as Burlington Northern Santa Fe, today it is simply known by the initials BNSF. BNSF often runs what they call legacy locomotives in Santa Fe's war bonnet motif in red, yellow, and silver. The only problem with that is this was the PASSENGER motif that was occasionally used for the Super C mail trains. The freight motif was a blue and yellow war bonnet. I can't believe nobody has mentioned the Harry Warren/Johnny Mercer song about this ("On the Atchison, Topeka, and the Santa Fe") from the movie The Harvey Girls. 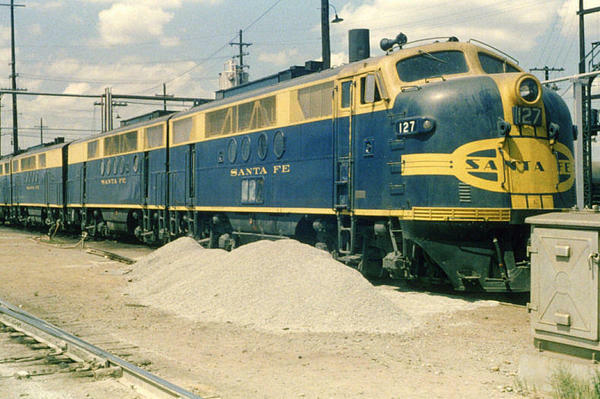 The idea of calling it the Santa Fe Railroad was that one of the lines followed the old Santa Fe Trail. Never did. You get off at Lamy. I recently learned that, despite its name, this railway didn't actually stop in Santa Fe.